Radiological patterns in sickle cell disease patients with acute chest syndrome: Are there age-related differences? Background: Acute chest syndrome is a major cause of pulmonary disease and mortality in sickle cell disease patients. Its diagnosis can be delayed due to differing imaging patterns between children and adults. Objective: The purpose of this study was to describe the pulmonary and extrapulmonary imaging findings in sickle cell disease patients with acute chest syndrome and determine differences in findings between adult and pediatric patients. Patients and Methods: This retrospective study analyzed the data of all sickle cell disease patients who were admitted with a diagnosis of acute chest syndrome to King Fahd Hospital of the University, Al Khobar, Saudi Arabia, between January and June 2015 (n = 150). After grouping the patients into adults and pediatrics, the pulmonary and extrapulmonary characteristics were identified and the digital radiography, computed tomography and laboratory findings were compared. 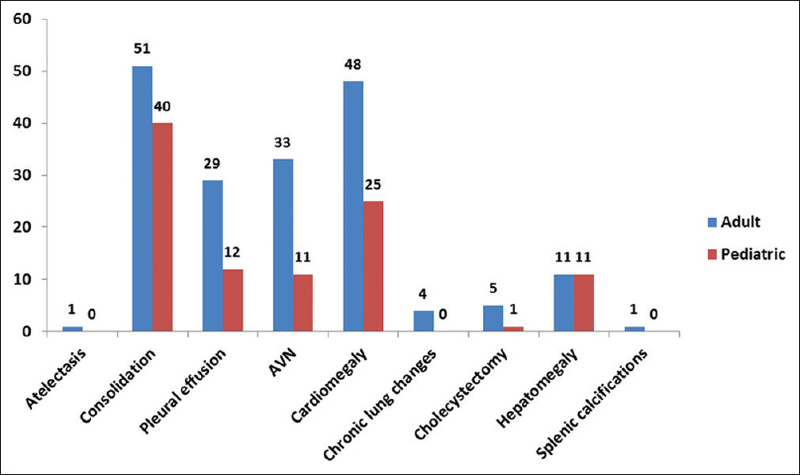 Results: A total of 116 patients with 163 acute chest syndrome episodes met the inclusion criteria, of which 69 (60%) were adults. In both adult and pediatric patients, the most frequent pulmonary finding was consolidation of the lung parenchyma. The right lung was most frequently involved: the lower lobe in adult patients and the middle lobe in pediatric patients. In addition, pleural effusion was observed in both age groups. Extrapulmonary radiological findings, such as avascular necrosis and cardiomegaly, were significantly more common in adult patients than in pediatric patients (P < 0.05). Compared with adults, pediatric patients had significantly lower hemoglobin levels (P = 0.001) and oxygen tension fraction in arterial blood (P = 0.007). Conclusions: Pediatric and adult sickle cell disease patients with acute chest syndrome typically exhibited similar pulmonary characteristics, whereas extrapulmonary findings were more prominent in adult patients. Furthermore, low levels of hemoglobin and oxygen tension fraction were dependent predictors of acute chest syndrome. Improvements in care have resulted in pediatric SCD patients reaching adulthood; however, managing disease in adult SCD patients, with or without ACS, remains a challenge because of the increased rates of mortality and complications. Further, adults experience more hospitalizations than pediatric patients as they would have undergone transfusions/chelation and exhibit classic chronic conditions., However, there is a lack of studies comparing extrapulmonary complications between pediatric and adult SCD patients with ACS, both in Saudi Arabia and internationally. Therefore, the current study aimed to describe the pulmonary and extrapulmonary findings on digital radiography and chest computed tomography (CT) in SCD patients diagnosed with ACS and to determine differences in findings between adult and pediatric patients. The findings of this study would likely provide helpful information for clinicians, including intensivists, internists, pediatricians and diagnostic radiologists, with regard to clarifying the various discrepancies between pediatric and adult patients, and thus enable timely implementation of treatment and minimization of complications. This retrospective cohort study included all SCD patients who were admitted with a diagnosis of ACS to King Fahd Hospital of the University, Al Khobar, Saudi Arabia, between January and June 2015. All clinical data were reviewed to confirm the diagnosis of ACS according to the most accepted definition: finding a new density on chest radiograph accompanied by fever and/or new respiratory symptoms, such as chest pain, cough and shortness of breath or hypoxia. Patients with incomplete records as well as those whose radiological images were not available for review were excluded from this study. Results of blood tests, liver and renal function tests and assessments of arterial blood gases were reviewed. In addition, radiological images of the chest, including CT scans and digital radiographs, were reviewed and reported by three certified radiologists with an average of 8 years of experience. To assess reliability, internal consistency (Cronbach's alpha) was calculated and agreement on all results was 0.949 (94.9%), indicating adequate reliability. Ethical approval for conducting this study was obtained from the Institutional Review Board of Imam Abdulrahman Bin Faisal University (IRB-2014-01-370) on December 21, 2014. All patients included in the present study had provided written informed consent prior to their data being collected. Parameters for pediatric patients: 70 kV, 1.9 mA, 1.75 mGy/m2, according to body mass index, focus–film distance 1 m.
Parameters for pediatric patients: 5-mm-thick slices; 120 kVp; 195 mA; pitch (gantry) rotation time, 100–200 ms; scan time, 4.20 s; rotation time, 0.65 s; dose–length product, 509.0 mGy; table feed, 3:1. In total, 30 and 253 digital radiographs of pediatric and adult patients, respectively, were analyzed. In addition, thoracic CT scans of three pediatric and four adult patients were analyzed. Continuous variables are described as mean ± standard deviation and were analyzed using the independent t-test and Mann–Whitney U-test. Categorical variables were reported as frequencies with percentages and analyzed using chi-square and Fisher's exact tests. P <0.05 was considered statistically significant. Data from 150 cases were reviewed, of which 116 cases with 163 episodes of ACS were found to be eligible and included in this study. The mean age of the study participants was 21 (±13) years, and 68% (n = 76) were male. The pediatric age group (≤16 years) accounted for 40% (n = 47) of ACS patients and adults 60% (n = 69). During the study period, five patients who were reported as pediatric patients at the inception of the study became adult patients. Therefore, the 116 cases included a total of 111 individual patients. In our cohort, the incidence rate of ACS was higher among adult than pediatric patients (P < 0.0005), and 54% (88 of 163) of all episodes were in patients who experienced a single episode of ACS. Digital chest radiography was the most commonly used imaging modality in the early diagnosis of ACS (90%). On chest radiographs, lung consolidation was the predominant pulmonary opacity observed during ACS episodes; the right lung was more commonly involved (n = 93; 57%). Of these, the right lower lobe was most frequently affected in adults (n = 32; approximately 34%), followed by the left lower lobe (n = 30; approximately 32%). In contrast, the middle lobe was more commonly involved in pediatric patients (n = 18; approximately 38%) [Figure 1]. 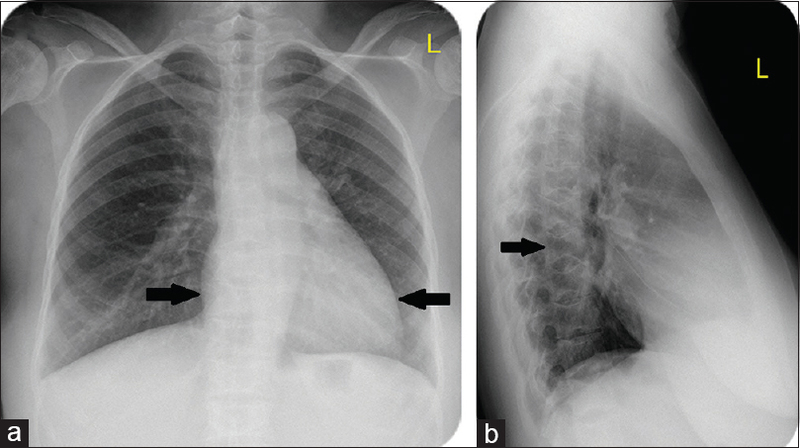 The most frequent pulmonary radiological signs found on digital radiography and CT scans of both age groups during the ACS episodes were consolidations of the lung parenchyma (n = 91; 56%) [Figure 2], [Figure 3], [Figure 4]. 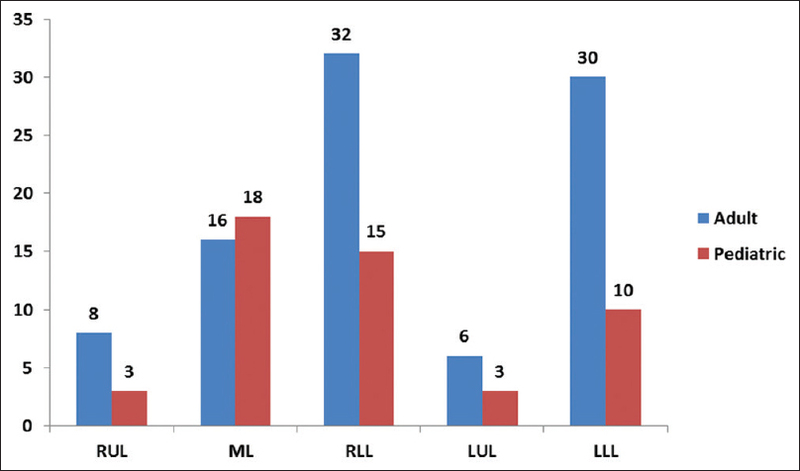 Cardiomegaly was observed in 73 episodes (45%) and pleural effusion was noted in both age groups (n = 41; 25%). Atelectasis was present in 1.4% (n = 1) of cases. Chronic lung changes, caused by exposure to multiple ACS episodes, pulmonary hypertension and/or cor pulmonale, were found only in adults with recurrent ACS episodes (n = 4, 3.4% of 116 cases, 5.79% of 69 adults). In addition, rhizomelic avascular necrosis (affecting shoulder and/or hip joints) was observed more frequently in adults (n = 33, 28% of 116 cases, 47.8% of 69 adults) than in pediatric patients (n = 11, 9.48% of 116 cases, 23.4% of 47 children). Among the adult patients, splenic calcification and cholecystectomy were encountered in 1.4% (n = 1) and 7.2% (n = 5), respectively. No splenic calcification and only a single case of cholecystectomy were reported among the pediatric group. However, hepatomegaly was found in both age groups (n = 11; 15.9% of 69 adults and 23.4% of 47 children) [Figure 5] and [Figure 6]. Laboratory findings indicated that hemoglobin levels were considerably low in both adult and pediatric patients. The hemoglobin level was significantly lower in pediatric patients compared with that in adults (7.8 g/dL vs. 9 g/dL, respectively; P < 0.001). Moreover, the oxygen tension fraction level in arterial blood gas was significantly lower in pediatric patients than that in adult patients (56.7 mmHg vs. 82.6 mmHg; P = 0.007). Other laboratory investigations were comparable between the groups [Table 1]. ACS is a common occurrence in SCD patients, typically encountered in pediatric patients;,,, however, mortality rates are higher in adult patients., Notably, the diagnosis of ACS can be delayed due to differing imaging patterns between the two age groups. Previously, several studies have focused on determining mortality rates in SCD patients diagnosed with ACS. Nonetheless, these studies used differing diagnostic criteria, mainly based on pulmonary characteristics and provided differing results; the major distinguishing factor was delineation of the affected lung. Recently, several diagnostic studies have investigated predicting susceptibility to ACS in SCD patients, such as using immunohistochemistry to evaluate platelet activation of plasma marker CD40 ligand together with thrombospondin, or using cytogenetics to study certain glycoprotein polymorphisms of vasculogenesis in embryological bases, which typify a raw and promising potential marker to evaluate susceptibility to ACS in sickle cell anemia patients., However, to the best of the authors' knowledge, few studies have extrapolated the associated extrapulmonary radiological characteristics for improving bedside imaging diagnosis of ACS., Improving the imaging diagnosis of ACS will enable timely implementation of treatment to minimize complications. Thus, it is important to identify imaging pattern discrepancies between pediatric and adult patients, as pediatric SCD patients with ACS exhibit high morbidity while adults have high mortality rates. In terms of extrapulmonary findings, this study found that cardiomegaly, rhizomelic avascular necrosis and hepatomegaly were present in both age groups. Therefore, these extrapulmonary findings are likely to aid in the diagnosis of ACS in all SCD patients. To the best of the authors' knowledge, no previous study has explored the extrapulmonary associations of ACS as complications of SCD. A recent study showed associations between the levels of hemoglobin and peripheral oxygen saturation in patients with SCD. Consistent with the finding of that study, the current study showed an association between reduced hemoglobin levels and oxygen saturation, which suggests the potential for novel therapeutic interventions by increasing the levels of HbF or hemoglobin–oxygen affinity. The current study results may be clinically beneficial in the treatment of SCD hypoxic complications and additional studies should be conducted to validate the results of this study. A notable limitation of this study was that it was retrospective in nature. In addition, a low number of CT scans were available for analysis and, thus, further radiological findings may have been missed in digital radiographs. Importantly, the study and analysis were limited to a single CT scan during each ACS episode and the authors were unable to assess its progression over time. Therefore, to validate the findings of this study, the authors advocate that future studies be conducted with a larger patient pool cohort over a longer follow-up period. Prospective or retrospective multicenter analysis may further strengthen the findings of the present study. Moreover, as ACS is a disease with a high relapse rate, the authors included all ACS episodes during the study period, an approach that is commonly performed in the relevant literature. The study found that lung consolidation is the most common pulmonary finding, frequently affecting the lower lobe (right more often than left) in adult SCD patients and the middle lobe in pediatric patients. In addition, pleural effusion was equally common in both age groups. Although pediatric and adult SCD patients with ACS had similar pulmonary findings, long-term complications are likely to differ. 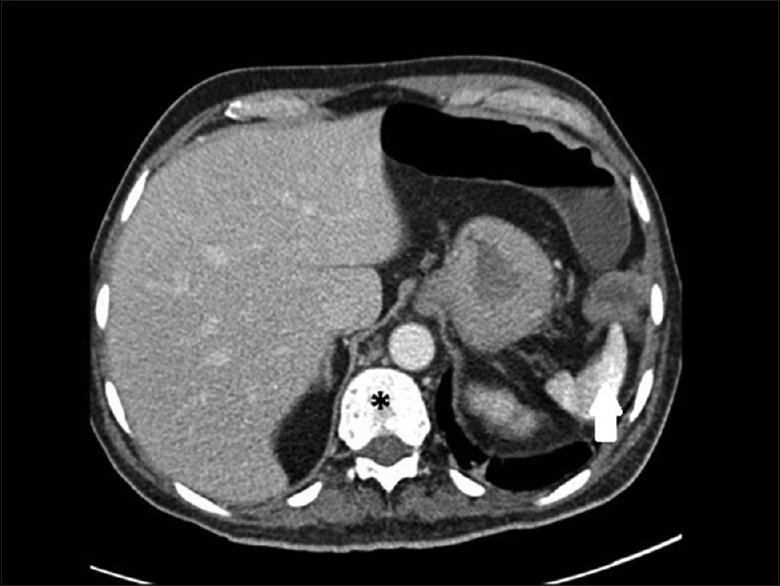 Extrapulmonary findings were more common in adult patients, most frequently comprising avascular necrosis, splenic sequestration and hepatomegaly, whereas cardiomegaly was commonly observed in both age groups. The authors wish to thank Mr. Hussam Al-Shammasi for his assistance in statistics. Charache S, Scott JC, Charache P. “Acute chest syndrome” in adults with sickle cell anemia. Microbiology, treatment, and prevention. Arch Intern Med 1979;139:67-9. Vichinsky EP, Styles LA, Colangelo LH, Wright EC, Castro O, Nickerson B, et al. Acute chest syndrome in sickle cell disease: Clinical presentation and course. Cooperative study of sickle cell disease. Blood 1997;89:1787-92. Novelli EM, Gladwin MT. Crises in sickle cell disease. Chest 2016;149:1082-93. Porter M. Rapid fire: Sickle cell disease. Emerg Med Clin North Am 2018;36:567-76. Alabdulaali MK. Sickle cell disease patients in eastern province of Saudi Arabia suffer less severe acute chest syndrome than patients with African haplotypes. Ann Thorac Med 2007;2:158-62. Alkot M, Almaghrabi WA, Al-Najdi N, Al-Otaibi M, Shatla M, et al. Prevalence of complications of sickle cell disease at Makkah Al-Mukaramah, Saudi Arabia, 2017. Ann Clin Lab Res 2018;6:226. Vichinsky EP, Neumayr LD, Earles AN, Williams R, Lennette ET, Dean D, et al. Causes and outcomes of the acute chest syndrome in sickle cell disease. National Acute Chest Syndrome Study Group. N Engl J Med 2000;342:1855-65. Siddiqui AK, Ahmed S. Pulmonary manifestations of sickle cell disease. Postgrad Med J 2003;79:384-90. Minter KR, Gladwin MT. Pulmonary complications of sickle cell anemia. A need for increased recognition, treatment, and research. Am J Respir Crit Care Med 2001;164:2016-9. Castro O, Brambilla DJ, Thorington B, Reindorf CA, Scott RB, Gillette P, et al. The acute chest syndrome in sickle cell disease: Incidence and risk factors. The cooperative study of sickle cell disease. Blood 1994;84:643-9. Madani G, Papadopoulou AM, Holloway B, Robins A, Davis J, Murray D. The radiological manifestations of sickle cell disease. Clin Radiol 2007;62:528-38. Simon E, Long B, Koyfman A. Emergency medicine management of sickle cell disease complications: An evidence-based update. J Emerg Med 2016;51:370-81. Heeney MM, Baltz B, Adams-Graves P, Yang E, Paley C, Esposito J, et al. Comparison of clinical outcomes between adult and pediatric patients (pts) with sickle cell disease (SCD): 3-year (y) follow-up in a prospective, longitudinal, noninterventional registry trial. Blood 2014;124:4890. Vichinsky E, Williams R, Das M, Earles AN, Lewis N, Adler A, et al. Pulmonary fat embolism: A distinct cause of severe acute chest syndrome in sickle cell anemia. Blood 1994;83:3107-12. Garrido VT, Sonzogni L, Mtatiro SN, Costa FF, Conran N, Thein SL, et al. Association of plasma CD40L with acute chest syndrome in sickle cell anemia. Cytokine 2017;97:104-7. Redha NA, Mahdi N, Al-Habboubi HH, Almawi WY. Impact of VEGFA -583C > T polymorphism on serum VEGF levels and the susceptibility to acute chest syndrome in pediatric patients with sickle cell disease. Pediatr Blood Cancer 2014;61:2310-2. Kayle M, Docherty SL, Sloane R, Tanabe P, Maslow G, Pan W, et al. Transition to adult care in sickle cell disease: A longitudinal study of clinical characteristics and disease severity. Pediatr Blood Cancer 2019;66:e27463. Mehari A, Klings ES. Chronic pulmonary complications of sickle cell disease. Chest 2016;149:1313-24. 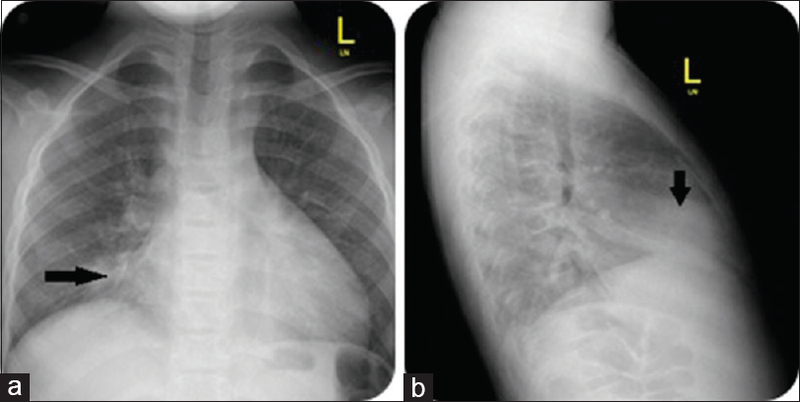 Leong CS, Stark P. Thoracic manifestations of sickle cell disease. J Thorac Imaging 1998;13:128-34. Adisa OA, Owusu-Ansah A, Abrahams AD, Ghosh S, Ofori-Acquah SF. Sickle cell disease and acute chest syndrome: Mechanisms and pathogenesis. In: Hematologic Abnormalities and Acute Lung Syndromes. Cham: Humana Press; 2017. p. 49-65. Nambu A, Saito A, Araki T, Ozawa K, Hiejima Y, Akao M, et al. Chlamydia pneumoniae: Comparison with findings of Mycoplasma pneumoniae and Streptococcus pneumoniae at thin-section CT. Radiology 2006;238:330-8. Woodring JH, Reed JC. Types and mechanisms of pulmonary atelectasis. J Thorac Imaging 1996;11:92-108. Nkya S, Mgaya J, Urio F, Makubi A, Thein SL, Menzel S, et al. 2017. Fetal hemoglobin is associated with peripheral oxygen saturation in sickle cell disease in Tanzania. EBioMedicine 23, 146–149. Abdulmalik O, Ataga KI. Clinical implications of the association of fetal hemoglobin with peripheral oxygen saturation in sickle cell disease. EBioMedicine 2017;24:26-7.